Post Sugar Crisp Dive In Ad 1955 This is an August 1, 1955 advertisement It is a nice color ad from Post Sugar Crisp, a product of General Foods. 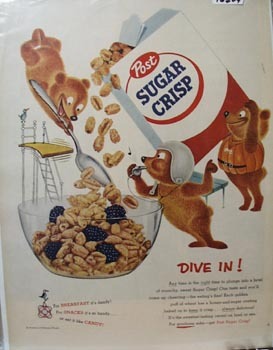 Pictures three little bears, a diving board and a big bowl of Post sugar crisp with berries. One bear is blowing a whistle, another bear is bouncing off the diving board headed for the bowl of cereal with a large spoon. Please note the little bird sitting on the diving board platform. It is captioned, Dive in. In mint condition. Photo is taken through plastic and may show wrinkles or crookedness that is not in the ad. This magazine tear sheet measures10 1/4"" wide by 14"" tall. Items Similar To "Post Sugar Crisp Dive In Ad 1955"